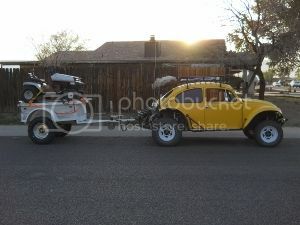 AzBaja.com, Home of the VW Baja Bug -:- Baja Forums -:- Off-Road & VW Based Clubs (4x4, ATV, Jeep, Motorcycle) -:- Events and Get Togethers World Wide -:- Official 2016 Hassaympa PlayDay Roll Call!! Baja Forums -:- Off-Road & VW Based Clubs (4x4, ATV, Jeep, Motorcycle) -:- Events and Get Togethers World Wide -:- Official 2016 Hassaympa PlayDay Roll Call!! Post subject: Official 2016 Hassaympa PlayDay Roll Call!! Please post up if you are going and Home many will be with you. We need to know how much food to Bring. The Az Pruett Clan will have about 12 people with all of the Family & Friends. I am going to try to get out there Thursday night... if not it will be Friday morning after traffic dies down. Post subject: Re: Official 2016 Hassaympa PlayDay Roll Call!! Kenny! Are you still making payments....??? Alyssa and I can not make it this year. Alyssa is having unexpected surgery for a stomach mass Thursday. Sorry to hear about Alyssa. Hope all goes well. Just an update on Alyssa, She got out of surgery around 11 am this morning. The Dr. removed a mass from her stomach that was about the size of a Coke can and it weighed just a little over a pound. (Alyssa is only 57 or so pounds) The Dr. did remove her appendix at the same time. Cool move on the Dr. part aka preventive maintenance. So we will never have to worry about an appendix issue in the future. I'm in a way glad this happened now than out at the river on this weekend, it could of been so much worse for her. I will were my shirts this Friday/Saturday at the Hospital. I will/try to go to Daryl's/Bugzylas event this Sunday. Be safe this weekend and maybe we should try to get something going again early next year. Alyssa so much enjoys going to the event. Glad to hear everything went well for Alyssa, Eric! I guess dust wont be a problem this year. And hopefully neither will getting stuck! [ Go to page: 1,	2	] 18 Dirtjunkie 6688 AzBaja Playday 2017?